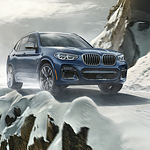 If you're looking for a sport activity vehicle (SAV), the BMW X3 should be at the top of your list. It may be available at BMW of Portland, and it comes with a spacious, comfortable and connected interior. Specifically, it comes with 62.7 cubic feet of space, which is enough to store everything you need for a trip to Portland. This is accomplished through seats that fold with minimal effort. In the event that you need to haul a boat or other large item, you can do that too. There is an optional trailer hitch that makes it possible to attach items directly to your vehicle. The connected interior means that you don't have to worry about losing touch with the outside world. It even comes with a navigation system that makes it possible to get directions simply by pushing a button or using your voice.